The Veronica Mars movie, reviewed: Kickstarter-funded feature is just like the TV series, and that’s great. Kristen Bell as Veronica Mars may look like a cutie patootie, but she projects an icy hauteur and impatient intelligence. Photo courtesy Robert Voets/Warner Bros. I cannot speak to the experience of watching the new Kickstarter-funded Veronica Mars movie without ever having seen Veronica Mars, the teen-detective TV series that ran for three seasons on UPN and then the CW from 2004 to 2007. But as someone who did watch—and love—the show, my recommendation to those of you who have not is: Go watch the series, all of it, then wait seven years. Then watch the film. Does that sound insane? The surge of delayed gratification that will wash over you upon being reunited with Veronica Mars, the surliest of blonds, and her snap-crackling fictional universe, will make it worthwhile. For those reasonable people unwilling to undergo this exercise in both binge-watching and self-denial, be aware that the film plays like an extended, excellent episode of the show, a distinction I do not mean as an insult, but a compliment: The Veronica Mars movie is exactly what the people paid for, and what they paid for is more TV. 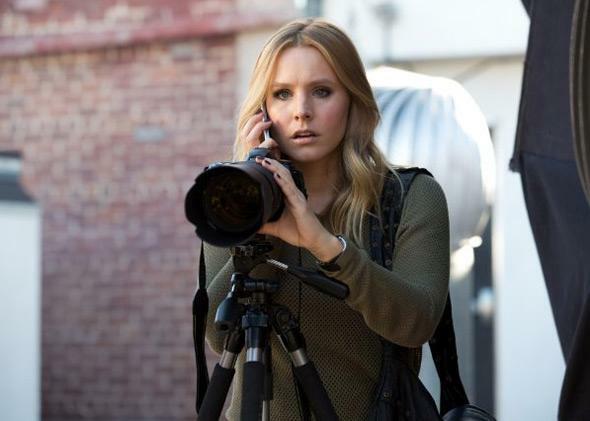 More than most films, which arrive in theaters with both artistic and financial expectations the audience is aware of, the Veronica Mars movie comes to us as both a piece of entertainment and a new sort of commercial product. A year ago, the show’s creator, Rob Thomas, launched a Kickstarter campaign for the movie that raised twice as much money as needed in a record amount of time and immediately suggested a whole new semi-crowd-sourced way to fund certain projects. (Warner Bros. kicked in funds as well.) The movie is being released in theaters and on VOD simultaneously this Friday, and how it performs economically and artistically will have bearing on what happens next: Is this just the first film of this kind, or will it also be one of the last? I don’t know how much money Veronica Mars will make, or how much money it has to make to be deemed a success, but as means of fan-satisfaction it is a needle to a major vein. Unlike the new, structurally complex Arrested Development, Veronica Mars’ only ambition seems to be to deliver a product of the same quality as the incisive, quippy show—not at all a low bar. By unapologetically being an extended TV-episode in movie form, Veronica Mars keeps on keeping on with its major theme: taking things that are assumed to be adorable and unserious and safe and complicating the hell out of them. The show told the story of a teenage PI, a blonde resident of Neptune, Calif., who starts solving crimes for her classmates. This description conjures to mind something cute and fluffy, but Veronica Mars is about as cute and fluffy as a mangy, underfed hyena. Kristen Bell, who plays Mars, may look like a cutie patootie, but she projects an icy hauteur and impatient intelligence. If the show sounds like a light-teen drama, week in and week out it was a surprisingly witty detective caper about class warfare, starring a newly unpopular heroine whose best friend had died and whose mother had left, who channeled her sadness and rage into a relentless, OCD hunt for various truths in a beach town as seedy as it was posh. The movie picks up 10 years after the show ended (basically so Veronica can attend her high-school reunion) and immediately begins grappling once again with deceptive appearances. Veronica has spent a decade becoming an upstanding and mentally healthy citizen, a “marshmallow” in the show’s parlance. She transferred to Stanford, got a law degree, is up for a big job at a fancy firm (she’s interviewed by Jamie Lee Curtis, one of the celebrities to make a cameo), and is in a relationship with nice guy Piz (Chris Lowell), and has not worked a case in years. She is finally the normal woman everyone always assumed her to be. But then Logan Echolls (Jason Dohring), Veronica’s very troubled, totally true love gets arrested for murder. (The chemistry between Veronica and Logan is another one of the show’s mysteries; ice princess meets sporadically fey bad boy does not sound like a recipe for a destabilizing-ly hubba-hubba relationship, but this is just another way Veronica Mars teaches us not to judge couples by their cover.) Veronica gets pulled in for one last case, a bad decision she makes both helplessly and knowingly, even as her beloved father looks on disapprovingly. The recurring theme in her voice-over is one of addiction: Veronica knows she is making unhealthy choices, but she can’t stop herself, partly because she loves the drama (and Logan), and also, because she is bored out of her mind. The movie is a kind of superhero story, but a little perverse; the hero has to be reborn, but she can only do so by giving into her own not-particularly-healthy flaws and accepting that she thrives in a not-particularly-healthy place. There are thing about this film that will aggravate people who have never seen the show: the aforementioned voice-over, the endless parade of characters they are clearly supposed to know but don’t. Even for fans, the mystery itself is not particularly thrilling. (This actually mirrors long-ago complaints about the series, which after its first season-long mystery never could gin up another with the same emotional heft.) But mostly the Veronica Mars movie is an object lesson in what TV can do that movies can’t: give its audience 60-plus hours of intimate knowledge of a huge cast of characters and their various interpersonal relationships. If you put in the time with the show, watching all of those dynamics pay-off in the movie is a high-order treat. And from the looks of things, there’s no reason it has to be the last: Veronica Mars is now poised to become as many movies as TV watchers are willing to pay for.